Book Review My Life as a Man By Carmen Winant Reviewed by Adam Bell Finishing a work of art is a mysterious and tentative process. Often it’s better to just walk away. Left “undone” a successful work of art hovers in a state of completion — a stasis of resolution. Carmen Winant’s My Life as a Man documents a large-scale collage as it is brought into being, torn apart and reworked over time. My Life as a Man. By Carmen Winant. Horses Think Press, USA, 2015. In English. 136 pp., 7x10". Finishing a work of art is a mysterious and tentative process. Often it’s better to just walk away. Left “undone” a successful work of art hovers in a state of completion — a stasis of resolution. Carmen Winant’s My Life as a Man documents a large-scale collage as it is brought into being, torn apart and reworked over time. Interspersed with unfinished textual fragments from various authors and paintings of single words or phrases, the book gathers a swirling constellation of image and text that speak not only to the unstable resolution at the heart of any creative work, but also illuminates the fragile beauty of the creative process itself. Composed of images cut and torn from magazines and advertisements from the mid-to-later 20th century, My Life as a Man is an evolving collage. Blue tape, clear tape, white tape, and torn paper dance across the pages. Clusters of female hands, red dresses, eyes, naked women, women posing for the camera or lighting demos, arms, legs, ponytails and more, fill the pages. Images appear, move, repeat, or disappear, leaving behind shreds, scraps and gaps. Held together by slivers of tape, the work is ready to collapse at any moment and feels barely contained within the book. In situ, the work occupies an entire wall, but the book is a collage of its own and illustrates the complex task of cataloging, grouping and organizing the images. As Winant has noted, the book reflects the process of the studio, where each page represents a moment in the work’s becoming and unbecoming. My Life as a Man. By Carmen Winant. Horses Think Press, 2015. Although very different, Winant’s work shares an affinity with the work of the Pictures Generation, who also plumbed the riches of our image-saturated culture to great effect. Like the early work of Richard Prince, who rephotographed recurrent themes in advertising, or Sarah Charlesworth, who astutely isolated objects and images to highlight their dense cultural, social and political meaning, Winant’s work employs recurrent images with great skill. Isolating these tropes, she reduces them to the bare minimum — hands, lips, hair, eyes etc… Intentionally rough, the fragments adhere as much to the contours of the image itself as they do the whimsy of Winant’s knife. Once mined and cut, Winant arranges her photographs in either tight clusters of repeating imagery, like mouths or hands, or in juxtapositions that draw formal and/or symbolic correspondence between the disparate parts. Named after the 1974 Phillip Roth book, My Life as a Man makes no apparent contentual reference to Roth’s book, but the cover does appear as a small image multiple times in Winant’s book. From the opening sequence, which groups an image of a naked woman laying face down on a table under the watchful eyes of a team of male doctors with various other images of men gazing at woman, it’s clear the work offers a pointed critique of the ways in which the female form and gestures are controlled and imaged. The use of Roth’s title then reads as a playful counter to the notoriously heterosexual writings of the iconic American author and recasts the work as the extensive catalog of an atomized male gaze, deconstructed and reassembled. 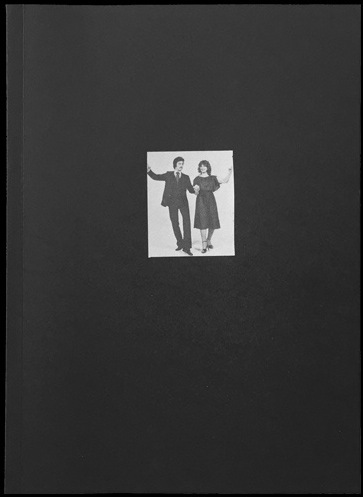 Along with the collage, the book contains two significant additional elements — twelve unfinished texts by writers as varied as Kenneth Goldsmith, Moyra Davey, and John Yau, and paintings of single words or short phrases, like The Answer, Forgiveness, Hot Tears, and Drive Hammered Get Nailed. Intentionally sloppy and often broken mid-word, the colored words hover on monochromatic canvases. Their open-ended declarations suggest a creative process that wavers between moments of inspiration, frustration and failure. The unfinished short texts are equally enigmatic and share the unresolved tension and suggestive meaning of the painted words and collage. Their beginning and end left open. Winant is an accomplished writer, so the inclusion of text draws clear parallels between the physical assemblage of images and the careful sequencing and ordering of words in a written piece. Two final elements are worth noting. Each book also comes with a unique collaged image on the cover and a folded poster of nearly completed New York Times crossword puzzles by Winant’s mother. Like the almost finished works that populate the book, the crosswords reflect the obsessive behavior at the heart of the book. Collected, preserved, and meticulously filled out, the crosswords mirror the reshuffling that occurs throughout — a hand here, a lip there, a dress over there. Like the letters and words of the crosswords, the images are in constant flux, looking for a coherent home or pattern, someplace to lock into place.